At the end of this module you will understand the procedures that must be followed when using recipes owned by third-parties, and when someone requests to use a CAC owned recipe. 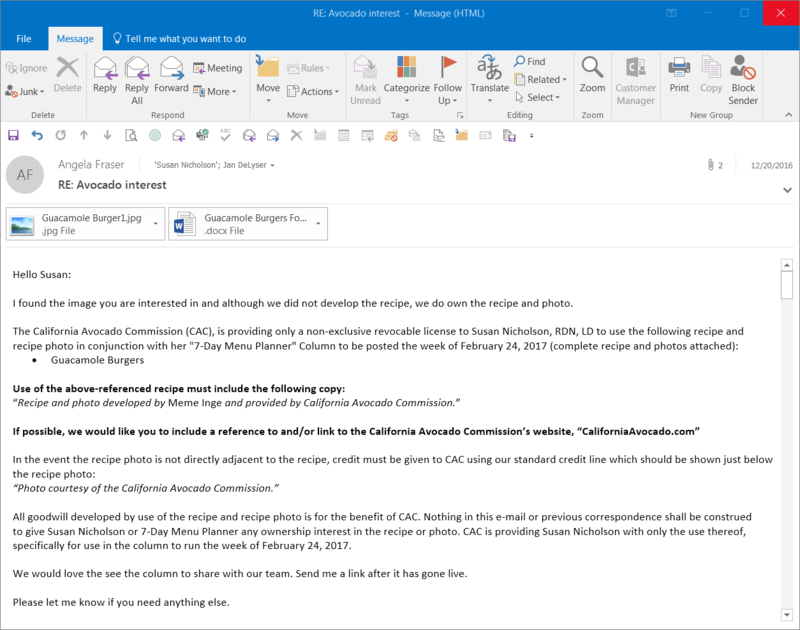 When using third-party recipes and recipe photos, videos, digital assets and social media assets, have them complete and sign a CAC Third-Party Release Agreement or CAC Chef Release Agreement which can be found in the “Resources” section of the CAC Style Guide (https://sites.google.com/site/californiaavocadostyle/). Thank you for agreeing to let the California Avocado Commission use your [enter general assets]. 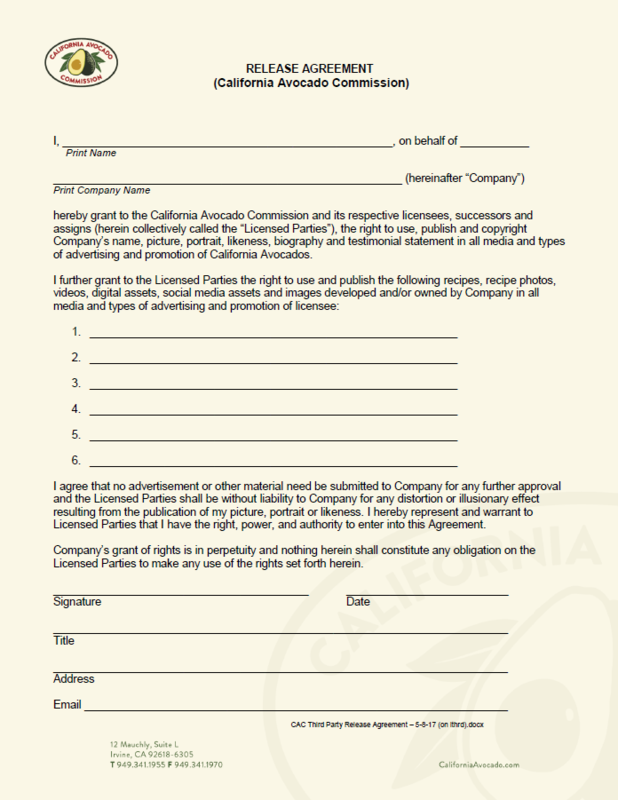 You further agree that no advertisement or other material need be submitted to [enter Company name] for any further approval and the Licensed Parties shall be without liability to [enter Company name] for any distortion or illusionary effect resulting from the publication of the above-referenced assets. You hereby represent and warrant to Licensed Parties that you have the right, power, and authority to enter into this Agreement. All requests for use of CAC recipes by third parties should be submitted to Angela Fraser. If the recipe is owned by CAC she will work with the appropriate department(s) to determine if we want to release the recipe for use. If CAC does not own the recipe and we do not have a release on file that gives CAC the right and permission to use that recipe and recipe photo outside of CAC programs, Angela will then check with the appropriate departments(s) to secure written usage approval. 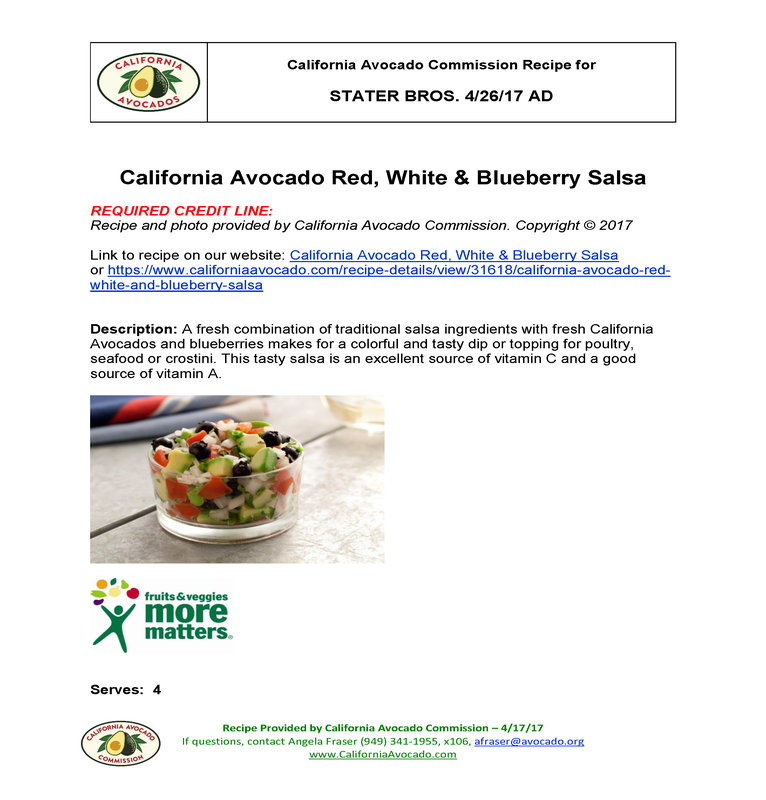 The California Avocado Commission's use of VENDOR services is conditioned on VENDOR understanding and agreement that the California Avocado Commission (CAC) is providing only a non-exclusive revocable license to use all CAC logos, pictures, and recipes in conjunction with the development and printing of the USAGE. All goodwill developed by the use of the logo is for the benefit of CAC. Nothing in this email or previous correspondence shall be construed to give VENDOR any ownership interest in the logo, recipes or photos. CAC is providing VENDOR with only the use thereof, specifically for the development of the USAGE. Can I go to a website and download a recipe and recipe photo and use in CAC programs? If a person tells me I can use their recipe, can I use the recipe in the CAC program and get the signed release later? Can I assume that if someone gives me a recipe, recipe photo, video, digital asset and/or social media asset, that they own the assets and have the right to give me the recipe and recipe photo? When giving someone else or a third-party permission to use our recipes from our website, do I have to check with anyone at CAC first?